﻿ Kervansaray Hotel Pamukkale. JIMAT di Agoda.com! Dengan 25 tahun pengalaman, Kervansaray Hotel menyediakan penginapan nilai-hebat dan pemandangan panorama pusat Pamukkale dari restoran atas bumbung. Bilik-bilik ini dilengkapi dengan ringkas, dihiasi secara terang dan beberapa unit mempunyai balkoni peribadi. Beberapa bilik juga menawarkan pemandangan travertine yang terkenal. Para tetamu boleh menikmati kolam renang luaran yang penuh dengan air terma yang kaya dengan kalsium. Masakan Turki buatan sendiri yang mewah disajikan untuk sarapan, makan tengah hari dan makan malam di restoran atas bumbung terbuka di hotel. Kervansaray Hotel terletak 5 minit berjalan kaki ke muzium, runtuhan purba dan Pamukkale yang terkenal dengan mata air panas. Please contact the property for early check-in. The owner and his family provide a really homy place in this town. Location is right in the center. Everything is great, thank you ! Loved this Hotel! Had lovely, bright room with balcony overlooking pool. It was cute with a lovely Turkish feel. Mayamud was fantastic and made coffee for us before our very early shuttle. Would recommend, just perfect! Great Wifi signal, and the room is good for its price, clean, and has all needed. Plus has extra of swiming pool and excellent location. The most important the owner is a great person and very flexible and helpful. He allowed us to check out 2h later and helped, advised and explained everything we needed to. Don't doubt to get there. 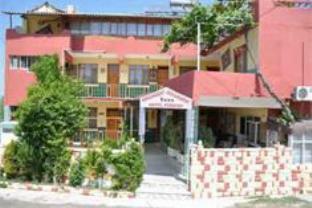 Also free parking in front of the hotel and great location close to Pamukkale travertines. I got this hotel due to nice reviews. I have got so impressed about staff, room condition, breakfast. It is easy to find the hotel from the bus stop since it is bright yellow colored building. Even if we arrived early in the morning, we could checked in early morning and they offered breakfast on the first day which we were not supposed to get. so helpful staff for everything, Wifi was working well. We got so cute and tiny devil eyes souvenirs from the owner. He is so warm-hearted person. I fully recommend this hotel it is not just because the price and location. I sincerely had great time here and was so comfortable staying. The staff is friendly and helpful. The hotel is very close to the Pamukkale's terraces. It is comfortable and quiet at night. The bathroom and the bed are clean. Very close to Pamukkale (about 5 min walk) It’s not really a hotel as such; it’s more like an en-suite hostel. It’s quiet; the owner of the hotel is always around and he speaks good English. The view from balcony is not nice so don’t bother to upgrade to the en-suite has balcony. The breakfast is served, not self-service. It’s not bad as there is no extra charge. The hot water isn’t stable tho. We are very satisfied stayed at Kervansaray Hotel, the room and bathroom is clean, the owner very helpfull, WiFi worked well at room, they served everything well. Near to the Pamukkale Entrance. The owner picked up us, when the minibus arrived at Pamukkale. Ein sehr nettes Haus mit zweckmäßigen, sauberen Zimmern in ruhiger Lage. Das Frühstück wird auf der Dachterrasse serviert, von der man eine schönen Ausblick über Pamukkale und die Sinterterassen hat. Es gibt keinen Grund zur Beschwerde, hat alles gepasst.